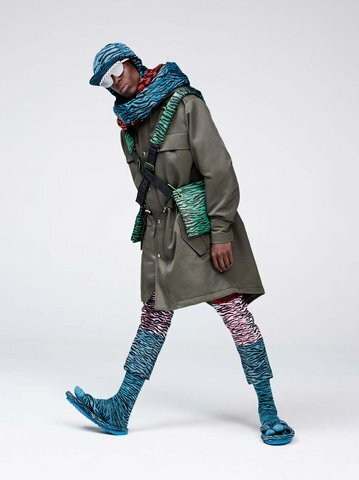 H&M has released a sneak peak of its highly anticipated H&M x Kenzo collection that won’t hit stores until November. Based off of three looks the fast fashion retailer unveiled this week, fans can expect lots of bold patterns and contrasting textures that are signature to the brand. Designers Carol Lim and Humberto Leon paid homage to the late designer Kenzo Takada with detailing, like the tiger stripes, being inspired directly on archival prints. Instead of professional models, Leon and Lim chose friends and influencers whom they felt embodied Kenzo beyond just a fashion statement, including makeup artist Isamaya Ffrench; Amy Sall, NYC-based student, activist, and founder of SUNU: Journal of African Affairs, Critical Thought + Aesthetics; Juliana Huxtable, an artist, poet and DJ also in NYC; and Oko Ebombo, Paris-based musician and performance artist. “People we admire, icons in their own fields, people who are influential beyond their fashion sensibility,” Leon told Vogue. Until then, we’ll just have to wait until Nov. 3 when H&M x Kenzo is available in stores and online.